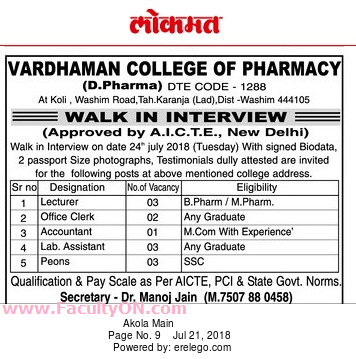 Vardhaman College of Pharmacy Washim has advertised in the LOKMAT newspaper for recruitment of Teaching Faculty- Lecturers Plus Non-Faculty jobs vacancies. Interested and eligible job aspirants are requested to walk-in on 24th July 2018. Check out further more details below. About College: Mission- To undertake the highest quality of technical education & research, forge industrial partnerships & deliver community service in order to meet the engineering manpower needs of the nation. How to Apply: Interested and eligible candidates are requested to attend the Walk-in interview along with CV, attested copies of certificates and 02 recent passport size photos to the walk-in address given below.